While many love knot earrings have a three dimensional look to them, these flush love knot earrings in 14K gold from Apples of Gold Jewelry have a more flat appearance, which can make prolonged wear much more comfortable! The clever design of these earrings have them lying closer to your earlobe, creating an interesting look that is both refreshing and fun! 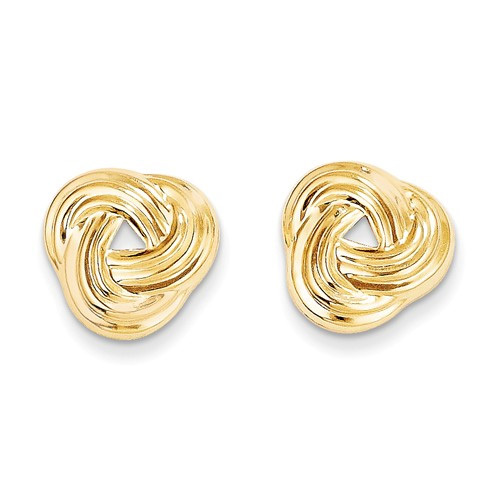 The 14K yellow gold love knots each measure 14mm by 13mm in size, and can be paired with other earrings or jewelry to complete your stylish look! We guarantee our Flush Love Knot Earrings in 14K Gold to be high quality, authentic jewelry, as described above.